Lewmar anchors lead the world in innovation engineering in a range that provides a solution for any anchoring requirement. 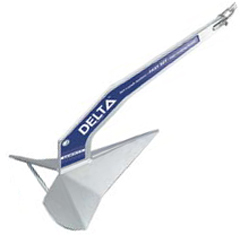 The range encompasses galvanized, stainless steel, dropped forged and fabricated anchors. Each model displays unique design features making it easy to find the anchor specific to your needs. Use the charts below to select the correct anchor size for your boat. Two factors need to be considered, the overall hull length and the boats displacement — whether it is light, medium or heavy. Boats of medium & heavy displacement at the upper limits of anchor performance should select the next model up.